THINK BIG! 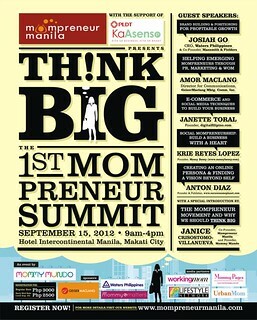 : The 1st Mompreneur Summit is open to active mompreneurs, aspiring mompreneurs and even regular entrepreneurs! EARLY BIRD RATE until August 24, 2012 is P 2,500 per person! *Fee includes a conference kit, lunch, morning and afternoon snacks. Please note that registration is considered confirmed only after payment is received. Unconfirmed slots may still be reassigned to other registrants. 2/F Fun Ranch, Frontera Verde, Ortigas Ave.
Open Mondays to Fridays, 9am to 5pm. b. Pay through the Mommy Mundo Multiply site and pay through credit card. Click here. Name: CREATIVE JUICE COMMUNICATIONS INC. NOTE: BANK DEPOSITS will only be accepted until August 24, 2012 ONLY. After this date, registation and payments must be made through the Creative Juice office or the Multiply site. Once you have completed the steps above, expect an email confirmation. For any questions, email info@momprenuermanila.com or call the conference secretariat at (02)4709925 or text 09189300313. Please send me information and updates of future projects and events. More Power!!! I’m very interested to seek other new avenues of opportunities for me as a mother of 3kids. I like thinking big! Can i pay in the summit site?